Here at Signature Hardwood, we pride ourselves on creating furniture which is practical, but beautiful. Our innovative pieces of furniture boast high-quality hardwood which is durable, but aesthetically pleasing. If you take a look through our pieces, you’ll notice the uniqueness of the hardwood. Each piece contains hardwood which has its own special knots and designs, thanks to the wood’s natural appearance. This gives each piece its own unique persona. In this article, we’re going to take a look at four hardwood furniture pieces you should check out. We’ve selected these pieces, because they are innovative and practical, but also display the wood’s natural beauty. This storage cabinet is made of maple wood. Its dark tones enrich whatever books or DVDs you store in this cabinet. There are six gaps for placing your books, and its depth means you can store most book sizes. While DVDs may be dying out, because of Netflix and other streaming services, that doesn’t mean that you need to place just DVDs in this cabinet. You can also display photo frames, ornaments, useful items, or whatever else you can think of in this cabinet. With six spaces in need of filling, you can easily place whatever you want into them. This table is incredibly stylish, and it helps children to unleash their more creative side. This table’s height is perfect to accommodate children who can’t sit at taller tables or find it a struggle to work at a busy, kitchen table. Instead, this round table can be placed inside their bedroom, and its smaller height makes it easier to access and sit around. They can draw, paint, do their homework, or have tea parties at this table. The lighter shade of oak gives this table a brighter, more upbeat atmosphere which can stimulate a lighter persona within their room. The colour is soft and soothing for their eyes and alleviates any feelings of stress. Since the table also comes with two drawers, they can store their art materials, dolls, or their toys within them. Whenever they want to pull them out, they can easily access them from the drawers. This table is sold separately to the chairs which accompany it. We also sell the stylish chairs, which are designed at the same height to the table. You can couple these with your purchase, if you would like the full set. If you’re looking for somewhere to display your widescreen TV, this is the perfect cabinet for you. 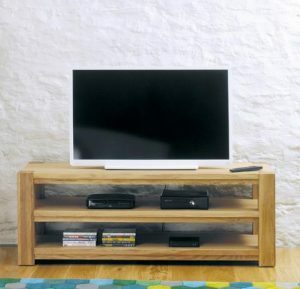 Its flat, low surface provides the optimum height for viewing your TV. Its lighter shade is refreshingly bright and stimulates a lighter atmosphere within the living room. 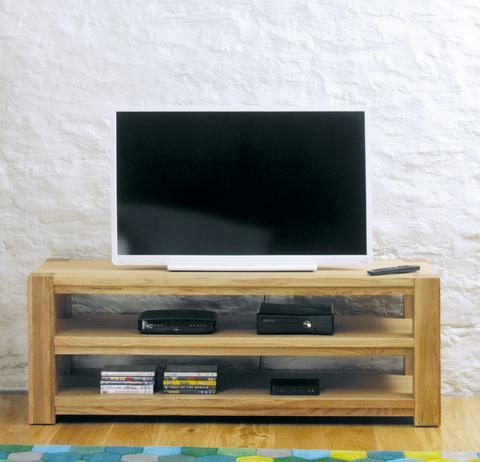 The oak wood doesn’t detract from the TV, but still complements any screen or size of TV. It also comes with storage underneath, so you can place whatever items you like inside. If you want a place to quickly access DVDs or CDs, you can place them under your TV. This makes for easy access and you can browse through your stacks whenever you want to watch a film. This is perfect for displaying LCD, LED, or plasma screens up to 72 inches, so you can store even the largest of TVs. Its smooth wood creates a modern style, but it doesn’t lose out on the more retro aspect, either. In the other storage space, you can store DVD players, or video game consoles such as the XBOX One or Playstation consoles. You can easily plug them into the TV, and turn them on and off, all without moving or placing extra storage spaces around the TV. This keeps your living room free from excess wires or extra consoles, and maintains all of them underneath the TV. This is one of our pieces which intertwines graceful style with practicality. The white painted wood boasts a luxurious high-quality style, and its smoothness offers a contemporary vibe. 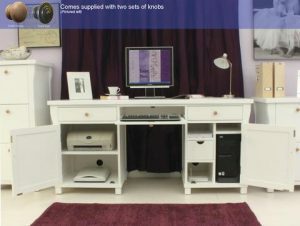 It creates the perfect setting for any office, and with its number of drawers and storage options, you can easily store all your office essentials within this desk. We have designed this desk with usability and ergonomically practical factors in mind. You have an area to store all your equipment, including a slot for your printer and a space for your desktop’s modem. The desk’s space means you have lots of freedom with space, so you can place desk lamps, your laptop/desktop, and files on one desk, without it getting cluttered and overcrowded. With the two drawers on either side, you can have access to pages, your office items, and more – all within a single reach. As you can see from this article, we provide a fantastic range of hardwood pieces and each piece serves a fundamental purpose to any home. You don’t have to assemble any of the pieces shown above, they are assembled for you. Make sure to contact us, if you’ve seen a piece of furniture you like. We manufacture and deliver furniture within 14 days, so we’re ready to take your order whenever you like. With Signature, you won’t get any flat pack furniture. All our furniture is delivered to you fully assembled baring a few products that require some minor assembly (see product description for more information). We believe in keeping shopping simple and here at Signature Hardwood, we offer a complete range of furniture for every room of the house and because we don’t have huge expensive showrooms, we are able to keep prices competitive and low but the quality of the furniture always remains high. If there is an item of furniture you have in mind that is not listed on our website, please contact us and we’d be happy to help discuss your requirements. We believe that you will be very happy with our products which will complement any room in your home and we hope that you find our site easy to navigate to find what you are looking for, however, if you are not 100% satisfied with any aspect of your purchase or you encounter any issues, please let us know, we are always ‘open’ and we will be more than happy to rectify the issue immediately. For more information please visit the Signature Hardwood Furniture website. If you want to make sure that your business is a really success in 2016 why not consider contacting a professional internet marketing service such as Direct Submit to help you find ways to give your website a real boost? 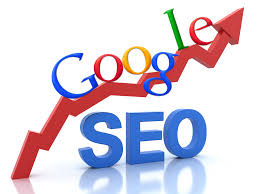 The use of search engine optimisation (SEO) and other internet marketing strategies is essential to any business if they want to be sure that potential customers and investors are able to find the products and services they offer easily and when employed properly can make a noticeable difference to the amount of traffic any website receives. As one of the largest independent windscreen replacement service providers currently operating throughout the UK. Specialising in car windscreen replacements and car windscreen repairs, including stone chip repairs, they guarantee to offer a very competitive price, plus their unique UK price matching service. Not only that, but they will always come to you in order to repair or replace your car windscreen repair. Their windscreen replacement service are available throughout the UK 24 hours a day, 7 days a week, replacing cracked or damaged windscreens, smashed windscreens and repairing car windscreen stone chip repairs. The team of qualified and experienced windscreen fitters will fit your replacement windscreen to the highest standards, visiting you at home, at work or any other location. They can process your windscreen insurance claim from start to finish, handling all documentation and contact with your insurance company. Glass Assist UK repair car windscreens, provide windscreen replacement services and offer stone chip repairs to glass windscreens throughout the UK. Got scratched or glass surface problems? Checkout the glass polishing services available. 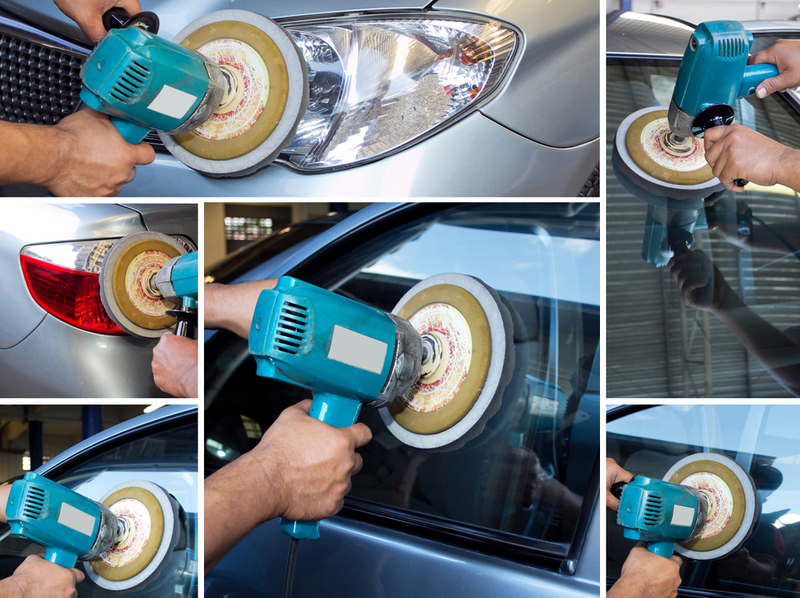 Utilizing the latest technologies in glass scratch repair and polishing services their skilled technicians can completely remove minor to deep scratches on almost any glass surface, effectively removing scratches on residential and commercial glass windows and on most vehicle glass surfaces. The Glass Assist professional glass scratch removal services provide building, home and vehicle owners with a simple, timely, more cost-effective and greener alternative to glass replacement. For more information contact Glass Assist Windscreen Replacement Services us 0800 1958 628 or visit the Glass Assist website for a prompt windscreen replacement & repair service anywhere in the UK. US tech giant Cisco Systems is cutting up to 7% of its global workforce, or 5,500 jobs, starting this summer. A report had suggested earlier in the day that the firm could cut as many as 14,000 jobs worldwide. Cisco said it was taking the “decisive” move so it could reinvest in faster-growing areas such as security and cloud computing. The US company employs about 70,000 people globally, with around 5,000 in the UK. “Today’s market requires Cisco and our customers to be decisive, move with greater speed and drive more innovation than we’ve seen in our history,” the company said in a statement. Cisco plans to reinvest the money saved from the job cuts in “key priority areas” for the company, including developments in the “internet of things” (connecting everyday objects to the internet), next generation data centres and cloud computing technology. Cisco’s traditional business of selling network switches and routers has struggled in recent years as demand from telecom carriers has fallen and competition from other suppliers has increased. In the fourth quarter revenue from the router unit fell 6%, while revenue at the switch unit grew by only 2%. The company has focused more of its attention on its firewall business that offers computer protection software. 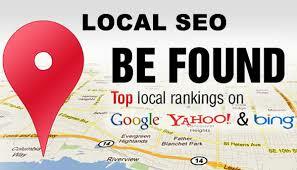 It has also devoted more resources to acquiring other businesses. In the last year Cisco has purchased 10 companies, many of which offer cloud-based services to connect or secure internet enabled equipment and devices. Overall, Cisco reported a $2.8bn (£2.1bn) profit for the fourth quarter, up 21% from the same time last year. It is the second tech giant this year to announce major layoffs. In April, competitor Intel announced it was cutting 12,000 jobs or 11% of its global workforce. Internet Marketing and Search Engine Optimisation (SEO) is simply a way of drawing traffic to your website through strategic use of keywords and key phrases that are relevant to what your potential clients are seeking out. With a well-designed company website and SEO marketing campaign, you will go from one handyman among many in your area to one whose company information is front and centre in online search results. Here are three simple yet effective ways of making your website work harder for your business. Number 1: What Good is Traffic Without Conversions? Continue to review / refresh your content every 3-6 months. Provide new pages with new information. This can help your website become more of an authority (important) within your industry which will provide new paths of traffic through different long-tail phrases. “Long Tail” phrases convert better and they also make it easier to dominate your competition in the Search Rankings. Go after the long-tail phrases with the short-tail as the base. By targeting the long-tail, the short-tail will also benefit. People searching via long-tail phrases often know exactly what they’re looking for and because of that, they tend to convert into customers at a higher percentage. Are you searching the Internet for makeup, cosmetics & hair extensions at Discounted Prices? Ellen’s Cosmetics of Newcastle offer a great selection of makeup, cosmetic, hair Extensions, smell alike perfumes – all at some of the lowest prices anywhere in the North East. Established for over 20 years, this busy little shop offers have a huge range of cut price cosmetics, perfumes, a unique range of smell alike perfumes, aftershaves hair extensions & beauty products. All ideal gifts for Xmas. Their range of perfumes and aftershaves includes Tabu, Pagan, Coty L’Aimant and Chique which are amongst their old favourites and best sellers. They also stock perfumes that compare to the latest best-selling designer labels. For example; how much is a bottle of Coco Mademoiselle for 55ml? Ellen’s Cosmetics have a fantastic perfume called Miss Tatu which is only £3.99 (£7 if you buy two bottles at the same time). If you are lucky enough to have the real thing why not keep it for evenings out and special occasions and wear our cheaper bottle for everyday use and see how much longer your expensive bottle lasts. Personally, we think why spend £30-£50 more when you can pay £3-£5 and spend the rest on something else (handbags and shoes spring to mind!). At Ellen’s Cosmetics all our staff pride themselves on the great, unbeatable, friendly customer service and our regular customers will tell you about the warm welcome you receive when you visit our shop. For over 10 years we have been located within The Grainger Market in the heart of Newcastle upon Tyne. For our new customers, the Grainger Market is a Grade 1 listed building opened in 1935 and is Newcastle’s largest traditional covered market.We have now raised over £1072 for our favourite charity “Maggies Cancer” (based at the Freeman Hospital in Newcastle Upon Tyne) and we are very proud of the generosity of our staff and customers who help us to support them. We are also the proud winners of “The Chronicle Cup” trophy. Sponsored by the Evening Chronicle this was created for the stallholder who had the best Christmas display and was awarded each year from 1931 until 1938 when it was locked away for safe keeping. The cup was rediscovered in November 2005 in the vault at the Co-Op Bank in Blandford Square and the tradition of awarding it was re-established by Newcastle City Council at that time. So if you are looking for that ideal Gift for someone you know, perhaps makeup, cosmetics or hair extensions all available at Discounted Prices visit the Ellen’s Cosmetics &. Makeup website today at the famous Grainger Market Arcade in Newcastle Upon Tyne or call us on 07752 249 754 and we will be happy to help you. Are you in the process of considering making home improvements, perhaps ready for a change to the all-important areas of your home, the kitchen and bathroom. 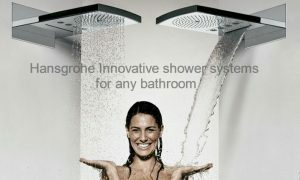 If you have plans to move to a new home or revisit a bathroom in your home, PT Ranson a leading UK bathrooms supplier, offer a divers range of designer showers and bathrooms available from the likes of Crosswater taps and bathrooms and Hansgrohe Bathrooms. For those looking to move house then the evidence shows that the rooms that buyers will often scrutinize are the kitchen and bathroom. Since other rooms can be improved upon with paint, flooring or carpeting and perhaps some minor electrical work, an attractive, recently updated kitchen or bathroom is more likely to tip the scales in favour of a sale. People adding a new bathroom to their home or upgrading to designer bathrooms have many things to consider before going into a showroom, and it is helpful to envision the desired result before deciding between the options that you have based on space availability, plumbing and other issues. One of the most obvious considerations is what you generally want your designer bathrooms to look like. Do you have a preferred colour scheme? What about a preference for features that will be easy to clean? Do certain types of fixtures appeal to you more than others? Next, consider how your preferences will work with the layout of your current bathroom. To what extent might the existing layout have to change? Would you be willing and able to consider a more extensive renovation that involves new plumbing and electrical wiring? Will the dimensions of your existing bathroom or planned add-on leave enough space and allow for comfortable placement of fittings and ease of movement between the tub or shower, toilet and sink? Once you have gone through this initial phase of the design process, you will be able to decide on the features that you would like to include in your renovated bathroom. Popular features right now include basin-style sinks on vanity bases with additional shelving or drawers, wide sinks and mirrors which can be shared by couples in master baths, free-standing tubs, recessed spaces for shampoo and other toiletries, stainless steel fixtures and white or off-white fittings against a dark background. If you have limited cabinetry in your current bathroom or exposed plumbing which you would like to conceal, certain luxury bathroom fittings by Kohler and others can solve both problems in the form of an equally attractive and useful vanity base which also will also make the best possible use of the space. Shower cubicles can also be an excellent space-saving feature which makes for easier cleaning.